Our mantra, ”Value through strategy”, means a lot to us. It is based on a fundamental belief that strategy is one of the most important business ideas of today. It is through the strategy you should clearly articulate why customers should come to you and not to your competitors instead. Consequently your strategy defines how you are competing in the market and as such it should give you the fundamental prerequisite for achieving profitable growth. Value through strategy is however more than just our mantra, it is our promise. One of the most common pitfalls in advising on strategy is to engage with the wrong approach. Executives that seek advice on strategy and in return get a ready-made strategy seldom manages to turn that strategy in to any tangible value, no matter how good the strategy might be. We engage through a unique engagement model that allows us to work closely with a fully engaged executive management team throughout the whole process of defining and realizing the strategy, hence increasing the possibilities of a successful implementation. Our expertise lies in the functional area of business strategy where we are leveraging the latest thinking in the business community at the same time as we are building on our own proprietary models and framework that have proved successful in several cases cross different industries. Our expertise allow us to engage with companies to assist in assessing, developing as well as realizing strategy. 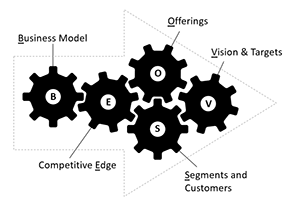 Based on our experience working with strategy we have developed a framework that we call VOSEB. VOSEB articulates all essential components of a comprehensive strategy: Vision and targets, Offerings, Segments and customers, Competitive edge and Business model. The model is used as a starting position on most of our engagements and tailored to specific customer needs and circumstances when needed. 2by2 work specifically to provide senior advisors that all have own hands-on, practical, experience from working with strategy. We work with a network of professionals which means that we are able to quickly add on additional resources if/when needed. In addition, 2by2 have established partnerships with dedicated research professionals cross Europe that can be quickly engaged in cases where primary and/or secondary research is needed.